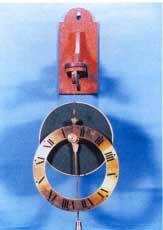 A book on how to construct a replica of a drum water clock. The drum itself is made from perspex sections in order to give visibility of the action of the water inside. Three different methods of utilising the rotation of the drum to indicate the time are given in the text. The clock requires winding daily and this is carried out by gripping the winding knobs at each end of the centre spindle and turning these, causing the drum to climb up the two cords from which it is suspended. The construction is illustrated using the Myford ML 7 Lathe. One of the original of these replicas made by the author can be seen in the Time dept. of the Science Museum, South Kensington, where it is exhibited alongside an original clock.